We got profitable in demonstrating fine quality range of Tube Couplings. Offered tube couplings are fabricated by our hardworking labors by using high grade steel and modern technology as per the quality standards. The provided couplings are tested by quality department for ensure its deformity. Every tube coupling is thoroughly examined by our quality department in order to assure its defect free range. 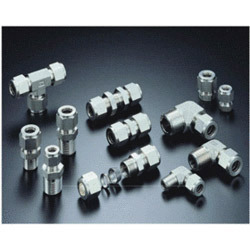 Customers can take these couplings from us at nominal rates. Annual Turnover2007-08 Rs. 50-100 Crore Approx. Highly appreciated in the market for the purpose of effective manufacturing, supplying and exporting an extensive range of high quality Ferrous and Non-Ferrous Products, Raymond Tubes was established in the year 1991. The product offered by us is inclusive of Round Bars, Metal Bars, Metal Pipes and many more. These ferrous and non-ferrous products are precisely engineered from high quality materials that are obtained from certified vendors. By using advanced machinery, tools and equipment, our professionals design these ferrous and non-ferrous products in adherence to industry set standards. These ferrous and non-ferrous products offered by us are highly demanded for rich features such as their impeccable finish, corrosion resistance, high tensile strength, weather resistant and durability. Since the establishment of our organization at V. P. Road, Mumbai, we have been backed by an efficient workforce that is trained through different seminars and workshops at regular intervals of time. The training helps our employees in enhancing and polishing their skills in the most efficient manner. In addition to this, they work in close coordination with each other to ensure a hassle-free working environment. Reliance Industries, Larsen & Toubro Limited and Bharat Heavy Electricals Limited (BHEL) are some of our reliable and trusted customers of our company. We export our products all over world.